It’s one of the most common and debilitating conditions of modern lifestyle. Back pain does not necessarily afflict only those who spend long hours in front of the computer. 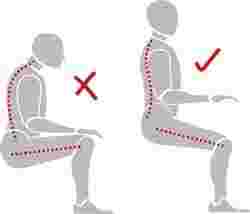 It can happen to all those who are not careful about their sitting posture. But being aware is no solution to this problem either. We need to apply it to our daily lives in a correct manner. Companies waste a lot of money trying to address the problem by getting “specially designed" workstations. We need to understand that the roots of back pain lie elsewhere and fancy apparatus is no solution unless we make some lifestyle changes. Let’s examine this problem more closely. What do ergonomically designed workstations mean? What is the correct sitting posture? Let’s take a look at a few tips from the Alexander technique (it is a method that works to change movement habits in our everyday activities, and is not a series of treatments or exercises, but rather a re-education of the mind and body). While these techniques go a long way in helping us understand our bodies better, they should not be done without expert supervision. • Always sit on the edge of the chair, rather than sitting all the way back. • Place your feet firmly on the floor, and keep them shoulder width apart. • In effect, your bottom and your two feet should form an equilateral triangle. • Now loosen up a bit, relax your shoulders and lean forwards at an angle of around 15 degrees. • Imagine having a string attached to the top of your head that’s pulling you up, not vertically but at an angle of around 15 degrees. • Your centre of gravity should be at the centre of the equilateral triangle formed by your feet and bottom. This is to ensure that the load is not on your spine at all. I strongly recommend that you master the above-mentioned posture before you try to do this . If your foundation is not solid, there’s no point building on it. But once you think you are comfortable with this posture, graduate to the next level. • Relax your shoulders. Imagine that the strings attached to your shoulders are pulling you up. • Cut those strings and let your shoulders drop. Relax your shoulders and elbows. Most of us have very strained shoulders. If you notice, most puppets have strings attached halfway through both their arms which are controlled by the puppeteer. Think of those strings. All your actions, such as using mouse or keyboard, should happen as if the puppeteer is in control.